Inks - A color assortment and black. Ink Bottles - Four ounce twist top. Flash - Lots of designs are needed. Pencils. Watercolors - To color flash sheets. This list is not totally complete, hut it is a good guideline to get you started. Few-people can purchase it all at once and must slowly put it together. Don't be frightened by the long list, all the equipment is quite small and portable. Compared to other businesses, this list is pretty simple and not as expensive as some practices can be. Buying in order of importance and practicality first seems to be a smart direction to follow. Everything should be within easy reach. The things used most often should be located the closest to you, and the items used less often are located further away. The items used the most are things like caps full of ink, the carbolated vaseline and the spray bottle of green soap. Also, the lamp and paper towels should be within easy reach. Slightly further back, but still within easy reach, is the spray bottle of alcohol, extra ink caps, three washes to clean the ink out of tubes when colors are changed, going from the first distilled water to the second distilled water to the alcohol last. 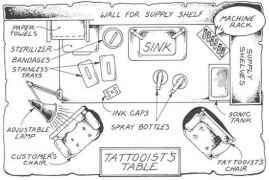 A little further back are bandage supplies, extra needle bars, tubes and inks, with machine rack just barely within reach to hold spare tattoo machines or another machine with a different set-up. One for outlines and one for shading and coloring. Some women would like to have a little privacy, so it is a good idea to keep a spare tube top handy for them, so they don't get any ink on their clothes. Many women will ask for a private session for more privacy. An office chair on wheels can be used to move around easily to get in different positions. It mayor may not have arms on it, has an adjustable back rest and the height should be adjustable also. Arm rests work good for steadying the hand while tattooing. A folding chair can be used for the customer to sit in. A front rail between the two front legs makes agood foot brace for the tattoo artist when working on an arm tattoo. Some like to work off their Jap and find it handy to brace elbows on their leg while doing a bicep. 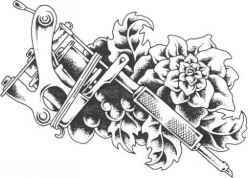 forearm or ankle. To do a back piece, have them sit facing the back of the folding chair with one leg through the opening in the back so they don't have to spread their legs so far apart. 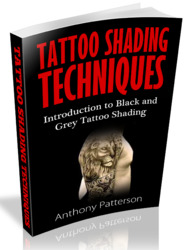 This position is easier for the artist as long as the tattoo is on the upper part of the back- A pillow under the customer's arms draped over the back of the chair will make it more comfortable. If the piece is too low down on the back to do comfortably in a sitting position, lay them down on a weight bench. The weight bench works well for chest pieces, stomachs, legs and backsides. You should move the customer where you can reach them best, and still have the ink, sprays and paper towels within easy reach. Then adjust the light so you can see well. This outline is a basic set-up to get you started. 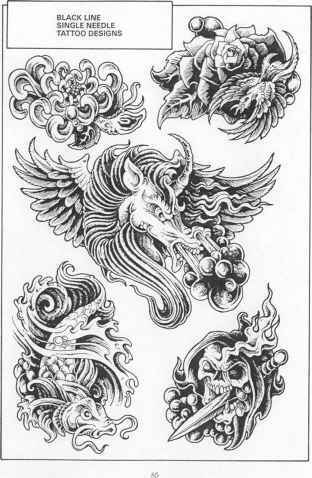 It is the duty of every tattooist to familiarize themselves with this, then take over where this chapter has left off, customizing the area to suit their own needs.